Cycle lanes are bad for business, right? February 7, 2018 / admin / Comments Off on Cycle lanes are bad for business, right? Typically with social media, no evidence is given for linking building cycle lanes and shops closing. 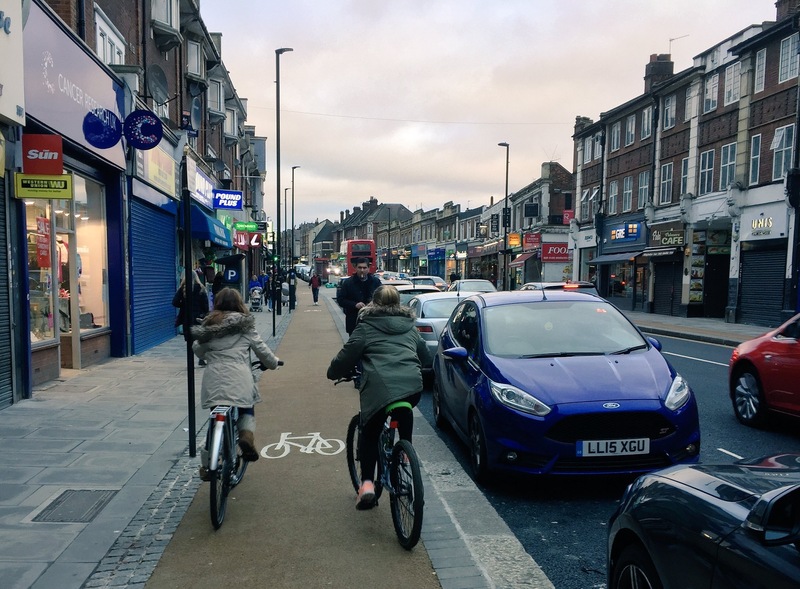 In fact in Palmers Green, while there have been some shop closures, there is zero evidence that they have closed or moved due to the cycle lanes or even the construction of the cycle lanes. In the same way that the idea “cycle lanes cause pollution” seems to have taken hold despite no evidence, this makes for a worrying trend. Will the lie that “cycle lanes close shops” become accepted wisdom? There is plenty of evidence from around the UK and the world that it isn’t true. Locally, let’s compare a couple of areas – Enfield Town and Palmers Green. Conveniently one has cycle lanes and the other doesn’t. They both have shops lining the high street, though Enfield Town is more compact (and is arguably more beautiful – or would be if it wasn’t blighted with traffic). I thought I would do a bit of ‘research’. I am not claiming that it is particularly scientific – how can it be, as I might miss a shop that isn’t closed and vice versa? 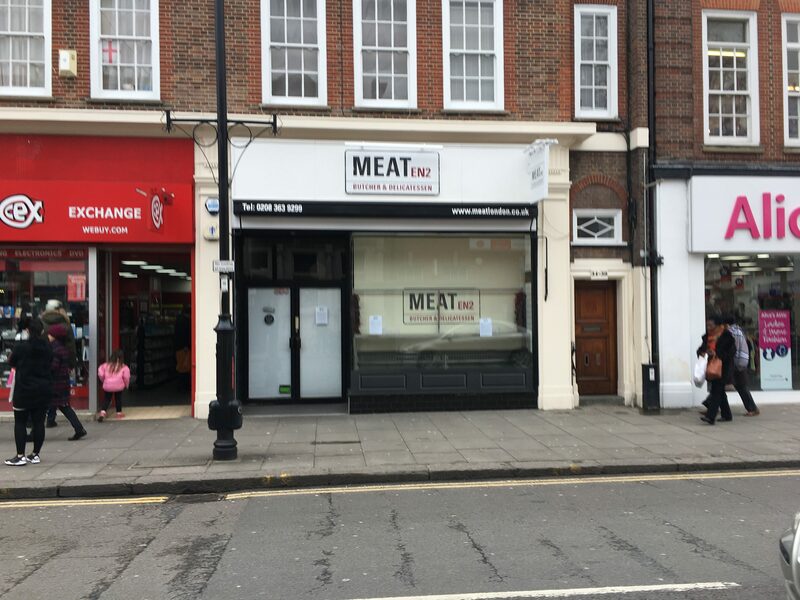 So with the aim of combining trips and buying something at Meat, the lovely new butcher’s (best to shop locally rather than go to a supermarket), I set off to Enfield Town. However the trip didn’t start well as Meat has in fact… closed down due to flooding and doesn’t look like it will open again. On the short high street (Church Street) seven shops are closed. They are dotted along the street and some look like they are in a prime position. I don’t know the history of the shops or why they have closed down. Otherwise, some shops looked like they had been closed a while and some more recently. Why is this still vacant? A lovely old building in such a prime location? Looking forlorn next to NatWest bank is this shop, in what should be a great location. Part of the problem though, is that it isn’t in fact a great location – due to the traffic. Enfield’s high street is competing with a pedestrianised shopping centre, Palace Gardens (an ‘open air mall’ next to the high street) at what is now the heart of Enfield Town. In the shopping centre I could only find one vacant shop (a Virgin Media branch) and that looks recently closed. People prefer shopping away from the traffic. It stands to reason that even a cycle lane moves the traffic a little bit further from you, and the narrower road calms traffic, and so it all makes for a better shopping experience. Making the roads more people friendly makes business sense. Church Street is busy and clogged with cars during the day but a racetrack at night. Night life is almost non-existent. 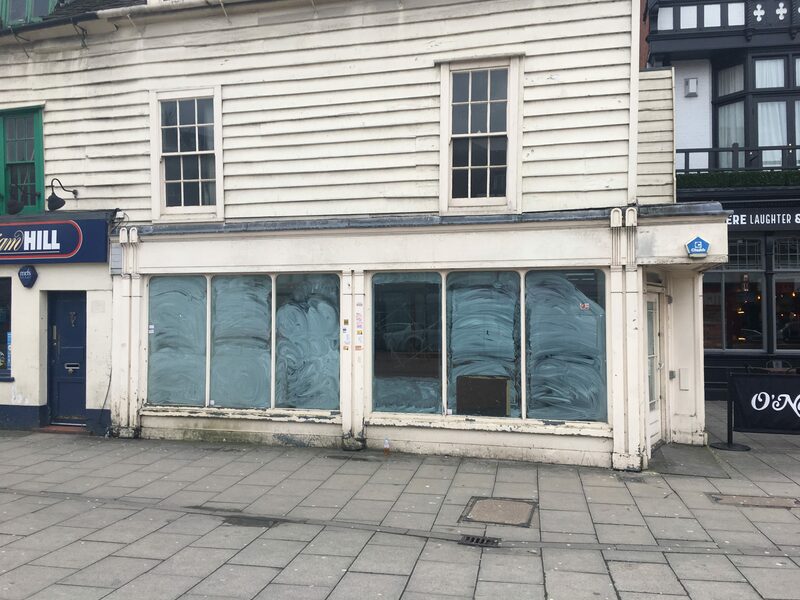 There could be bars and restaurants – but not at the moment, as when the road is empty, cars go through the high street at 40+mph. Surprisingly given the huge amounts of traffic, people do want to cycle to Enfield Town. Perhaps this family used the safer route along Green Lanes, as I did. They were all cycling including the grandfather who looked in his 70s. While the shopping centre could never be described as beautiful, parts of the high street could. The market square, while busy during the day, could have a thriving evening life. A restaurant could spill into the square like The Kings Head does in the summer. This former bed shop closed recently. 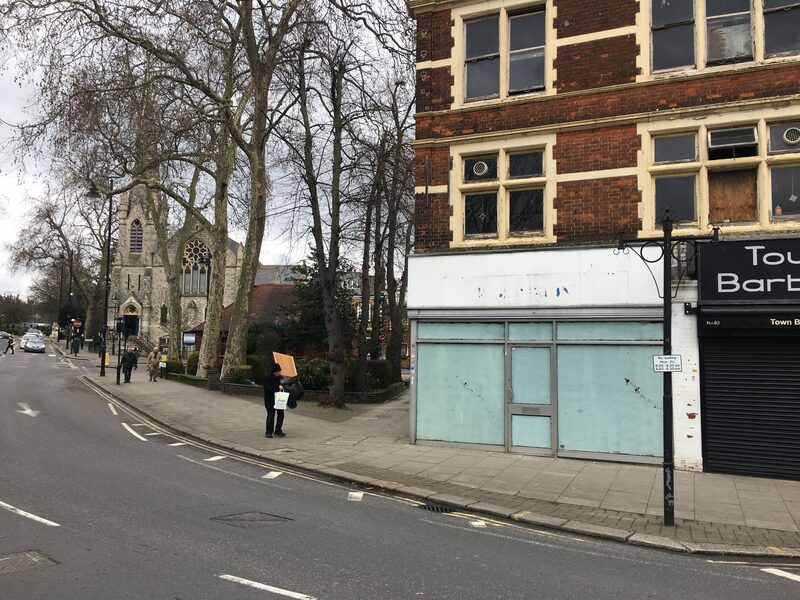 At the far eastern end of the high street is this closed shop on the corner – in some ways a great location, with the church as a backdrop and opposite a lovely park with Enfield library. But this is near where an elderly woman was trapped under a lorry on the day of the 2016 Enfield Parade of Lights. It’s easy to see how this happens as people drive fast round the blind bend. Another memorable recent incident involved a driver burying their car in an estate agent’s on Church Street. Here is the Crash Map data for the high street, below. What about Palmers Green? What about all the shops that have closed due to the cycle lanes? I counted seven closed units on a slightly longer stretch of road than Church Street. Two were at the extreme southern end – a print shop that had relocated (due to the sad and unexpected death of its owner), and a restaurant right next to the newly expanded (and great) Aksular restaurant. The two closed shops most talked about are Starbucks and Multiyork as these are large shops. In fact, Starbucks closed its Palmers Green outlet as it was too large. We confirmed with the manager that the decision was made before the cycle lanes went in and was timed to coincide with the end of the lease. It has been suggested that the cycle lanes caused Multiyork to close – but in fact nationally the whole business went into liquidation. Other shops, like the cafe next to Amy’s hardware store, closed well before the work started; and most of the others also look like they have been closed for years. Store 21 closed because it went into liquidation. Palmers Green has lost Waitrose, but the unit isn’t vacant as the Co-op moved in. Of course, those who think cycle lanes are bad for business blamed Waitrose’s closure on the cycle infrastructure. I think that can be discounted, as they reopened a store further up the road in “upmarket” Winchmore Hill…right next to the cycle lane! Finally, maybe the problem with the new cycle lanes is that they haven’t gone far enough. As part of Waltham Forest’s Mini Holland, one high street called Orford Road was closed to all traffic between 10am and 10pm except buses and bikes. Traders were so convinced that the lack of car access and parking would kill the high street, they brought a coffin to the opening ceremony. In fact, Orford Road is now thriving. For the first time in its history, there isn’t a single vacant unit. I wonder what lessons we can draw from that about people, local business and traffic? Will the death of Anita Szucs change anything?